M-uniquipality. Nothing new under the hifi sun. Old wine in fancy new goblets. Take your pick. The feeling could be familiar; mutual even. But for HighEnd Munich 2018, it wasn’t entirely accurate. True, it took some digging to deflate but there were signs of true novelty I stumbled across without any plan. And let’s assume that I missed a lot. 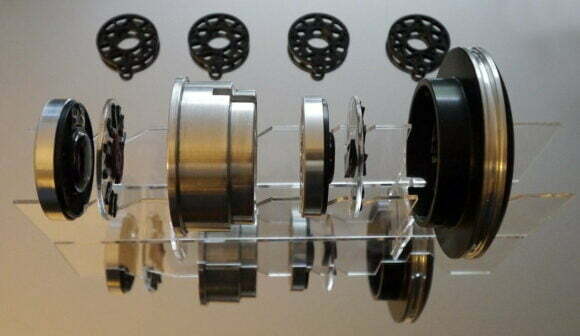 Let’s start with loudspeaker transducers. We’ve seen omnipolar tweeters before. Think Gallo’s CDT III, mbl’s Radialstrahler, Elac’s 4pi ribbon. There simply aren’t many which counteract the beaming so typical with conventional dynamic tweeters of the 1” dome sort. The M.O.C. & Marriott had some. 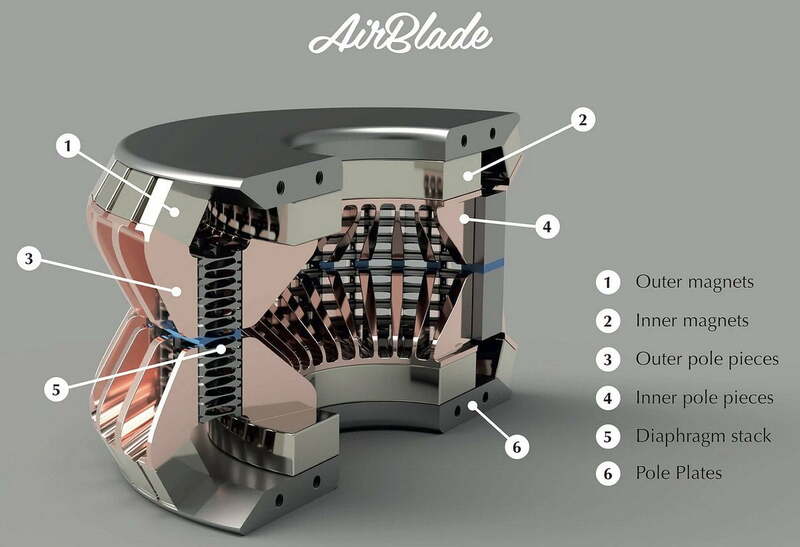 Take Arya Audio Lab’s AirBlade. It uses “ring-shaped foil elements arranged in layers with conductive aluminium traces directly applied to them to increase diaphragm surface x 37 over a conventional 1” tweeter whilst having similar outer dimensions”. 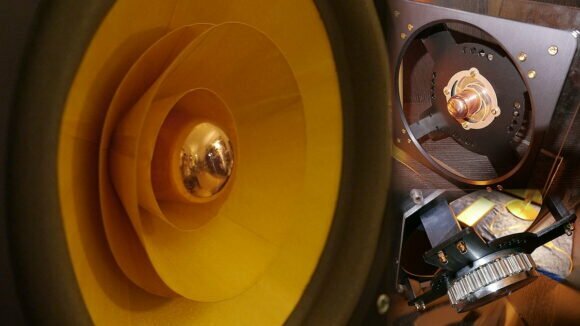 Specs are 1kHz-20kHz bandwidth, 180° or 360° dispersion, purely resistive 4Ω impedance, 19’200mm2 diaphragm surface and a motor with 34 neodymium magnets. 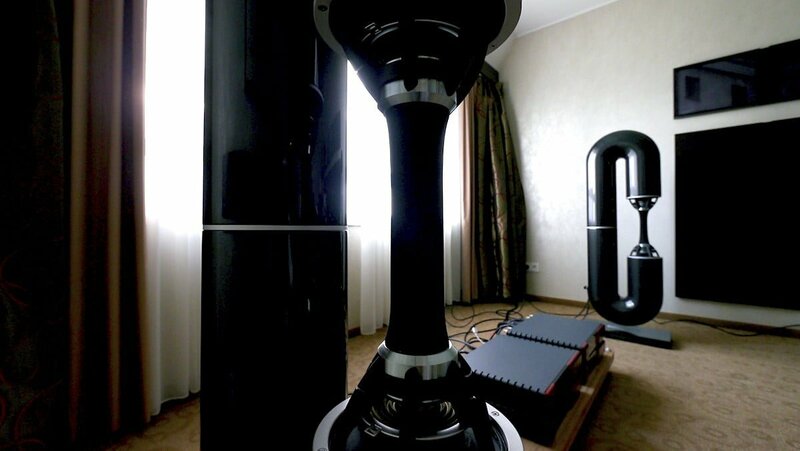 Bayz Audio’s inventor Zoltán Bay from Hungary demonstrated his non-ribbon twin-element omni-tweeter in his Courante speakers. Those were shaped like a big C formed from 1mm thin carbon tubes in whose opening sat the mystery tweeter. This device claims to be feather light and free of any breakup modes but isn’t an electrostat. And rather than punishing inefficiency as one sometimes gets from radical mechanical contraptions, it’s a normal 90dB sensitive. The active demo was very promising and the provided graphs were impressive. Those who remember the Linæum speakers of yore which eventually licensed to RadioShack in the colonies will recall their floppy membrane tweeter which sat atop a small box like a mini Mohawk. Before Linæum dissolved, they had scaled up that driver to become a matching midrange and extend the bandwidth across which their proprietary tech could be used. The Bay area hifi store I worked in at the time had a rare pair of those. 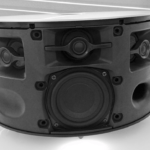 In 2006, I’d written a feature on Aero Loudspeakers which wanted to take over the baton from Impact Technologies’ Airfoil project which had wanted to resuscitate said driver tech when RadioShack went under. That must have failed. Then a Mr. Deminière in France took over further R&D to develop his Janus 50. In Switzerland, that sired a commercial offspring called the Rubanoide which is still made by Serge Schmidlin of Audio Consulting. In France, Audionec developed their take on this 200Hz-20kHz duo-pole driver which is used in all of their current models and augmented by dynamic woofers. Whilst not their first time in Munich, this driver remains unique and new enough that a US reviewer in his show report mistook it for an Oscar Heil-derivative AMT which it patently isn’t. 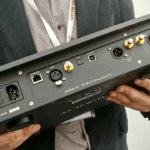 Audionec’s Munich demo was brilliant. Chris Hardy from New Zealand’s Wing Acoustics gave a talk on their acousticWing transducer which promises zero resonance distortion across virtually its entire operating bandwidth and the world’s cleanest waterfall plot by being a rigid driver. I didn’t attend the presentation but curious readers can look up their website here. 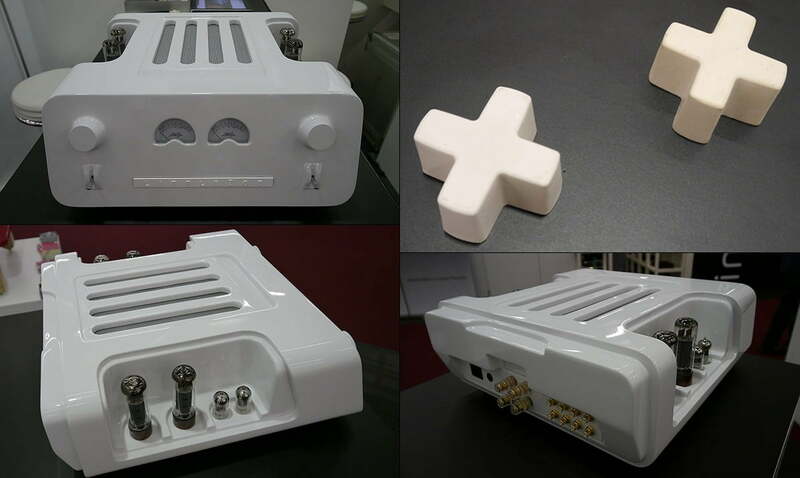 For electronics, innovation needn’t be a circuit or code like Leedh’s no-loss digital attenuation logarithm. It can be new enclosure tech. To make that point, Greek architect Dimitris Karayinnis had invested two years to identify the ideal lab-made synthetic, then learnt how to mould it into a seamless organic chassis without screws but true inertness to act like the proverbial stone to micro resonances, not the morse-code railway track of metal chassis. The Newcomer area had a sample of their Little Zoe valve amp which, at least to my way of thinking, heralded the beginning of a much-needed rethink for how today’s makers of high-performance electronics package them. It’s far from just a cosmetic issue. It’s very much a performance issue. Why not more of the big electronics firm pay attention to breaking the current box mentality barrier is unclear but hopefully more will follow this exciting Greek example. And to do something a bit different for dynamic headphones, Spirit Sound Design showed three different models of open-backed isobaric headphones which put two identical drivers per channel in series just like isobarically loaded loudspeakers have done it with woofers for ages. In headphones I’d simply not seen it done before. Likewise Cube Audio’s triple-whizzer 10” widebander. Their Grzegorz Rulka very concisely explained the function of each whizzer, some of which fill in the HF response or cancel out certain nonlinearities. The inset photos show his uniquely executed low-loss phenolic spider and neodymium ‘flower power’ motor. It was lovely to see creative thinking applied to this oldest form of speaker transducer whilst further increasing its useful bandwidth. 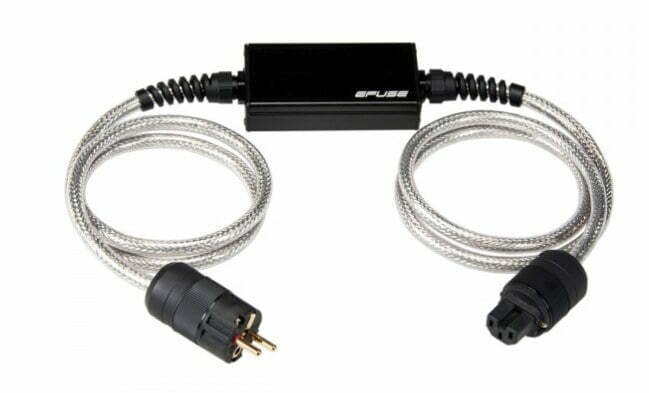 Finally, Efuse of Germany proposed an electronic fuse replacement for the ubiquitous tiny-wire sacrificial parts which instead has a reset switch and comes in admittedly expensive external and built-in versions. And there you have it: my fistful of new tech discoveries from this year’s biggest audio show in Europe. Srajan’s Munich 2018 report – all eight pages of it – can be read on 6moons here.